Friends of the Wild Whoopers - Page 79 of 80 - Whooping Crane conservation. The whooping crane has long been the flagship of the conservation movement. The majestic bird—North America’s tallest—flies more than 8,000 kilometres each year, breeding in northern Alberta and wintering in marshes along the Texas coast. Still, its future remains uncertain. Today we think of species becoming endangered when sprawling big box stores and subdivisions displace remnant natural areas within and around our cities or when large-scale industrial resource extraction fragments wilderness areas. Whooping cranes have a longer history. In the late 1800s, Canadians began farming the prairies, expelling cranes from their breeding habitat. At the same time, Americans drained west coast marshes, where whooping cranes overwintered. Hunting also contributed to their decline. North America was once home to more than 10,000 cranes. By 1938, the population reached an all-time low of 14 known adults. In the early 1940s, the conservation movement leapt into action. Over seventy years later, after significant breeding-area protection, captive breeding, aircraft-led migration and relocation efforts, the whooping crane has made a slow, often tenuous comeback. Today there are several captive-bred and non-migratory populations, but only one—shared by the U.S. and Canada—that is self-sustaining and wild. That group breeds every year in Wood Buffalo National Park, which straddles the Northwest Territories and Alberta, and winters in Texas, flying about 4,000 kilometres each way. Although the population has been steadily increasing—there were 74 nests counted in Wood Buffalo National Park in 2013 and a few breeding pairs outside the park—it still faces a number of perilous risks in Texas and Alberta—not un-coincidently, the oil kings of North America. Despite the many years and millions of dollars dedicated to the recovery of the whooping crane, continued habitat degradation darkens its recovery horizon. Although the birds have a national protected area in Canada to breed, they still need to survive along their migration and stopover route—right over the Alberta Tar sands. One of the most serious threats to the population is juvenile birds dying during their migration from Wood Buffalo to Texas. They risk landing in toxic tailings ponds, flying into power lines and exposure to water and air contaminated by the bitumen extraction process. The fact that there is only one self-sustaining wild population of crane heightens the risk of a single, catastrophic event. Crane recovery efforts cannot be done in isolation. National parks that protect Canadian breeding areas are important, but insufficient if the cranes can’t safely make their way back to Texas for their blue crab feast. For the whooping crane—and for Canada’s over 300 other at-risk species—we need to find ways to maintain healthy, functioning ecosystems even where development occurs. 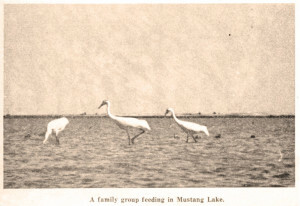 Migratory Behavior of Whooping Cranes. Probably less than a dozen persons in the past 50 years have actually witnessed the northward departure of whooping cranes (Grus Americana) from their wintering grounds on and adjacent to the Aransas National Wildlife Refuge on the Gulf Coast of Texas. Few, if any, have observed a more spectacular exodus than the junior author watched on the morning of 6 April 1966. On this clear, sunlit day he was conducting a combination routine and spring whooping crane departure date patrol through traditional crane habitat along the east shore road of the refuge. While traveling southwesterly one-half mile north of the northeast corner of whooper feed plot No. 1, he counted 32 of the giant birds within this managed crane feeding area. When he was about 1,000 yards from the cranes, 12 of them arose and flew eastward about one mile and lit along the northwest edge of Sundown (Mullet) Bay. While watching the 12 birds alight, he heard the obstreperous calling of most or all of the remaining cranes and turned to see that these birds had taken to the air. It became apparent later that they were en route to their remote northern nesting area. Shortly after taking to the air, the flock quickly divided into groups of 3, 3, 2, 7, and 5 birds and circled clockwise, upward, and northward in a spiraling motion. The groups of 7 and 5 birds were thought to be yearlings and non-breeders. The remaining groups were family units. The horizontal and vertical separation of the individual groups varied and was estimated to range from 400 to 1,200 feet. The diameter of the circle was judged to be one-fourth mile. The 20 cranes left the ground at 9:00 am; 12 minutes later they were only visible as tiny airborne specks, and in a few more moments they were no longer discernible through a 7 X 50 binocular. Winds at the time of departure were from the southeast at about 18-20 mph. Each turn of a group of cranes into the wind resulted in a gain in altitude. As the birds spiraled upward, they maintained their respective positions with no noticeable change in the size or shape of the spiral. They “whooped” continuously as they moved upward and away from the observer. At no time were the 12 birds remaining on the ground heard calling. Earlier that morning Benham had observed one immature and two adult whooping cranes feeding inside whooper feeding plot No. 2, approximately one mile north of the main body of birds. They had not flown as he passed about 1,500 feet from them. On his return past this spot he noted the three cranes about 500 feet off the ground, spiraling and calling loudly in a manner similar to the previously departed birds. The time was 9:14 am. At 9:19 am, Benham lowered the binoculars to rest his eyes. When the three cranes were last seen, they appeared larger than the 20 birds at last glimpse, so it is possible constant surveillance with the binoculars would have rendered the trio visible for longer than five minutes. It is reasonable to assume calls of the first departing cranes were heard by the later migrating family because of wind direction, audibility of the cranes’ piercing whoops, and the close distance between the two groups when the airborne flock flew over or within one-half mile or less of the family unit. We hypothesize that the exodus of the 20 birds precipitated the departure of the lone family group. It is interesting that the first contingent of migrating cranes displayed some aerial territorialism, although they were all observed feeding side by side within the food plot a few minutes before departure.—Robert H. Shields, Bureau of Sport Fisheries and Wildlife, Portland, Oregon, and Earl L. Benham, Bureau of Sport Fisheries and Wildlife, Austwell, Texas. Will Bugles Blow No More? FACTS ARE INVARIABLY garbled in any hot-stove league. The Blackjack Peninsula, lying on the Gulf Coast of south Texas, near Austwell, was purchased as a national wildlife refuge not only to protect a remnant of the endangered whooping crane but also waterfowl, upland game and big-game animals. The Aransas National Wildlife Refuge, administered by the Fish and Wildlife Service, also furnishes feeding grounds for such fine waders as reddish, snowy and American egrets, Louisiana herons and the rare roseate spoonbill. These birds nest on the nearby Second Chain of Islands in San Antonio Bay, a sanctuary guarded by the National Audubon Society. HEART-SHAPED, THE peninsula is fringed with salt marshes which are dotted with brackish ponds and bayous. The gently-rolling interior of the refuge is prairie-like, much of it covered with oak and sweet bay brush. There are scattered mottes or groves of large, windswept, gnarled live oaks, wrapped with mustang grapevines, and an undestory of mustang French mulberry and palmetto. WHILE THE PURCHASE of this land for wildlife purposes was not made until 1937, it had served as a sanctuary since 1921. Mr. Leroy Denman, former owner and active conservationist, had protected wildlife on the area, and through his efforts herds of white-tailed deer and flocks of Rio Grande turkeys had increased tremendously. These animals still range through the mottes, parks and brushlands, together with the oft-persecuted peccary or javelina, native wild pig of the South-west. OF THE 235 SPECIES of birds now known to have visited this 47,000-acre sanctuary, it was the whooping crane, largest of them all, that most intrigued me. Even before going to Texas, I anticipated seeing these birds on the refuge, one of their ancestral wintering grounds. ONE LATE OCTOBER afternoon, shortly after I assumed my duties as manager of the Aransas Refuge, I accompanied some visiting officials on a tour of the area. At that time the roads were mere sand ruts cut through pasture land, winding, where necessary, to skirt “the brush.” As we came around a thicket into open grassland, we heard the guttural croaking of sand-hill cranes, alarmed at our approach. Looking ahead, we saw about forty of these birds gathered around an artesian well. Our binoculars picked out from this group two stately white birds, much taller than their companions. How magnificent they were! Their plumage gleamed in the bright sunlight. We could see a carmine crown, forehead and lores, and a patch of red along the lower part of each cheek giving a walrus mustache effect. To watch these wary giants teeter from one foot to the other while awkwardly scanning the vicinity for danger was a never-to-be-forgotten experience. Here at last were those rare, beautiful, spectacular birds—the whooping cranes! All too soon they flew, revealing another distinctive marking, the black wing tips. EACH AUTUMN WHOOPING cranes come to this avian winter resort for a five or six-months’ vacation. Old-timers, who once owned small cattle ranches in the Blackjacks, told me that back in the ’70s and ’80s, hundreds of the big white birds were present from October to April. Their occasional raids on sweet potato patches near ranch-houses made them none too popular with housewives. Generally, though, they preferred to feed on shellfish and mullet, which they picked up in the salt marshes and ponds near St. Charles, San Antonio, or Mullet bays. The sand-hill crane, a much commoner bird, usually stayed inland on the prairies or in brush-lands. Mexican cowhands recognized this habitat preference of the whooper and, with their penchant for picturesque names, called it Viejo del Agua—the old man of the water. MOST LOCAL NAMES are based on the color of this species or on its call notes. Adults are known as white cranes or Grulla Blanco; immature, cinnamon-colored birds as red cranes. One accepted name in Texas is bugle crane—since the loud piercing notes sound like a trumpet. But if you have ever heard a child’s intake of breath while suffering from whooping cough, you’ll know why the crane is called a whooper. Imagine the volume multiplied many times—and then crouch within thirty feet of the birds, as I have—the result is ear-splitting and blood-curdling. No wonder this war whoop can be heard at a distance of more than two miles! FOR THREE WINTERS we kept careful count of the cranes on the refuge. In 1938-39 there were 10 adults and 4 immatures; the next winter 15 adults and 7 young; in 1940-41, 21 adults and 5 young—the largest population noted in recent years. We were inclined to consider this growth in numbers as a hopeful sign that the species was increasing until we realized that possibly it was due to “foreign” birds from the Louisiana marshes supplementing the usual wintering flock. The number of young birds which have been coming down from Canada with their parents each fall has been pitifully small. Although whoopers ordinarily lay two eggs, the hazards of hatching and rearing young birds were such that most parent birds, that had had any success in nesting, were accompanied by an “only child.” Very few family groups ever contained rusty-colored twins. Confronted with such low nesting success and survival, how can this species persist, let alone increase? PERHAPS WHOOPING cranes could not have survived this long were it not for their natural wariness. They prefer broad expanses of prairie or open salt marsh permitting an unbroken view of the surroundings for miles around. On the refuge, they favor tho salt flats, lagoons and brackish bays where crabs and mollusks abound. Sometimes, birds venture into the brush in search of blackjack or live oak acorns, but bay flats are more to their liking and there they find greater safely. They feed in small groups, a few adults or a pair with its young. Immature birds are almost invariably flanked by their parents whose ever-watchful eyes scan the countryside on the lookout for signs of danger. CRANES HAVE A CRAVING for fresh water and will fly long distances for a drink. In the fall of 1939, fresh water was at a premium and cranes frequented an artesian well on the refuge twice a day. Here was a chance for some close-ups of the birds! One day John Lynch, biologist with Fish and Wildlife Service, and I hopefully set out with Leica and movie camera to photograph one of the most difficult subjects in the American bird world. WE SNEAKED UP to the well on hands and knees, collecting stinging nettles and grass burs all the way. Then as luck would have it, a cowboy flushed the cranes and geese resting there. Hiding in the corner of an old corral about fifty feet from an overflow pool near the well, we made a makeshift blind of boards and dead weeds while we waited. Two hours later, in came two groups of cranes—a family of three and a group of three adults. We expected a fight for we had noticed that family groups on the feeding grounds resented the intrusion of other cranes. However, a truce was called until all thirsts were satisfied. The male of the family group was not enthusiastic about the strangers but tolerated them. Flocks of Canada geese, widgeons and pintails flew in and lined up for water, awaiting their turn, but did not drink until the cranes had finished. The male of the family group took pokes at geese when they got “out of line,” and once he jabbed at another crane that got in his way. This bird, caught off guard, tripped and fell over a much surprised Canada goose resting nearby. We got our pictures—although we were more nervous than the birds! I WELL REMEMBER another memorable occasion. One April morning, patrolman Everett Beaty and I were on the east-shore flats trying to determine how many cranes remained of the winter’s population. The few birds we saw appeared nervous as though impatient to be off for their summer home in Canada. As we watched a feeding pair, the larger of the two suddenly approached its companion, jumped into the air with outstretched wings, then alighted and began to flutter his wings and bow. Could we believe our eyes? Yes, we were watching the first stages of the famous courtship dance of the whooper! This dance, if it can be dignified by such a term, never lasted more than a minute or so. It did, however, take place occasionally throughout the day between extended periods of feeding. THIS STATELIEST OF birds loses all its dignity while courting. Picture, if you will, Ichabod Crane of Sleepy Hollow at a jitterbug contest. The male jumps into the air, beating his wings, then flutters about his mate. Sometimes he bows low, an ungainly curtsy, with head and body near the ground. While in a crouching position, his wings droop, he charges toward his mate, circling her and perhaps letting out a few whoops. At times both birds face each other, jumping up and down while their wings beat the air. Most of the dance is performed by the male, the hen playing the role of interested onlooker. She often acts coyly, blithely feeding while walking away from him. Then, if her mate’s ardor lags, she turns about and flies to him as though begging for more attention. This leads to more bowing and scraping on his part. 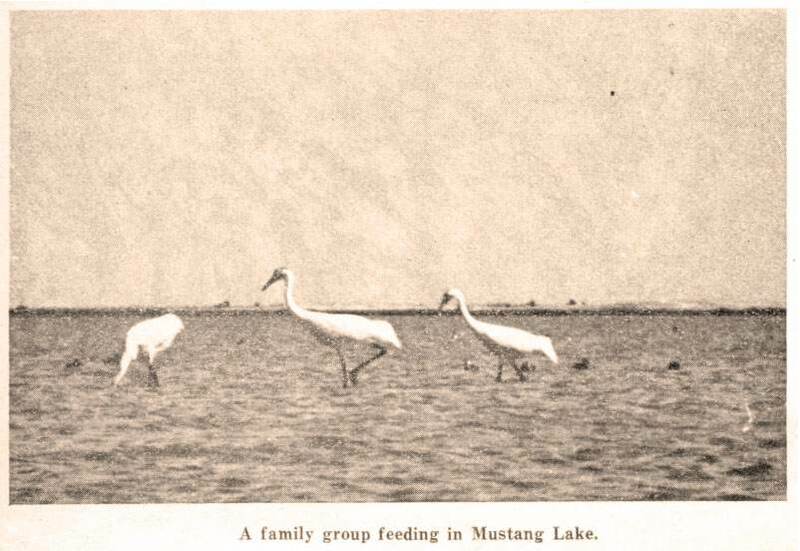 A LATE-STAYING FAMILY group, lingering on through May, in 1941, gave us the opportunity to observe how the young birds are treated during the season of courtship. It was comical to find that the young bird of this group, so jealously guarded during the previous winter by its parents, was an unwanted wallflower when the male asked his mate for a dance. At this season, the male had no use for his offspring and would threaten it every time it came near; the young bird then wandered off to feed alone. The pair couldn’t be blamed, of course, for wanting a little privacy for their wild hopping and ungainly antics which kept up until late June. After that, the courtship subsided, and the immature crane was allowed to rejoin the older couple. Although the birds remained on the refuge all that summer, it is doubtful whether they attempted to nest. We had hoped, of course, that the birds would nest on this southern refuge, a custom which, it is said, they practice in the Louisiana marshes. There, some cranes spend the year-round, and it is rumored by some persons, and sworn to by the Cajuns, that they have nested there for many years. WHAT IS LEFT OF the flocks of thousands and thousands of whoopers that formerly crossed the Plains twice a year in passage between their nesting grounds of Canada and the Prairie states, and their winter home in Mexico and the Gulf region? A sorry remnant at best—probably not more than two hundred birds. They formerly wintered by the hundreds in the lagoon country of northeastern Mexico, but none has been reported from that region in recent years. As far as is known, the only important wintering grounds are now those in the White Lake region of southern Louisiana, and in the Aransas Refuge and vicinity on the south coast of Texas. 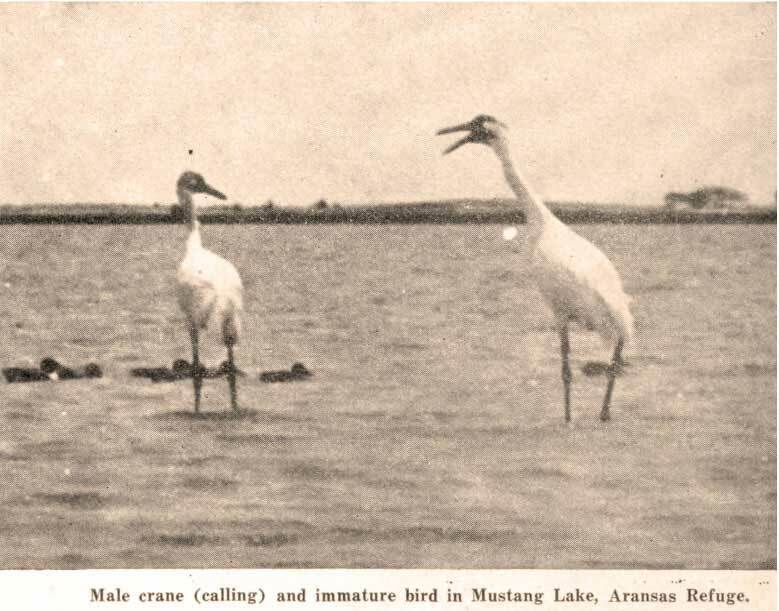 It so happens that only 15 birds (13 adults and 2 immatures) spent the winter of 1941-42 on the refuge; and persons who searched the Texas bays and marshes for other groups were unsuccessful. EVEN ON THESE coastal marshes, once a safe haven for wintering cranes, the birds were threatened. Bombing and machine-gun ranges for Army Air Corps use have been created on the barrier islands because “the areas are isolated and comparatively few people will be affected by their use.” Cranes, unfortunately, have not yet come to fear the target shooting boatmen on the Intra-coastal Waterway which invades the heart of their feeding grounds. Exploration for oil and the drilling of wells in the marshlands and bays also continue. Are the birds to be driven from their last stronghold ? PERSECUTION BY MAN and reduction in nesting areas due to drought and drainage, has brought the species to a low point from which it may never recover. Probably some of the adults we now find are old, sterile birds incapable of producing young. There are few of them left and the gauntlet they fly twice each year is a hazardous one. True, they are protected by international treaties and some help is given them on wintering grounds, but little pot-shooting here and there could easily wipe out this conspicuous bird. IS THE OLD WHOOPER doomed? What can be done to help this bird ? For one thing, we need a complete life history study that will point out the specific requirements to save this species from oblivion. This approach to the problem is fundamental; it has already been used by the National Audubon Society in the case of the roseate spoonbill and the ivory-billed woodpecker. We know there is need for additional patrol, for an educational campaign to be carried out in the vicinity of the birds’ wintering grounds. The Canadian breeding grounds are now mainly restricted to southern Mackenzie and northern Saskatchewan, and possibly sections of Alberta; however, the exact location of nesting areas is shrouded in mystery. The summer homes of these cranes must be found and a study made to determine factors limiting nesting success and rearing of young. The information will be basic to wise conservation and management. Possibilities for a refuge on the resting grounds in Nebraska where the birds stop in migration are now being explored. It will be necessary for conservationists to muster every available resource in the last faint hope of saving this crane. Come Whoop It Up at our 18th Annual Whooping Crane Festival! Join us February 20-23, 2014 for a weekend full of all things ‘birdy’! Early registration closes February 10. Register today by clicking here! Guest Speaker Added to Festival Line-up Attendees at the Whooping Crane Festival in Port Aransas will learn even more about the endangered species this year! For the first time in the festival’s eighteen year history, the superintendent of Wood Buffalo National Park in Canada will be one of the featured speakers. Rob Kent, who oversees the nesting grounds of the cranes, will give a special presentation on Friday evening, February 21, at UTMSI. 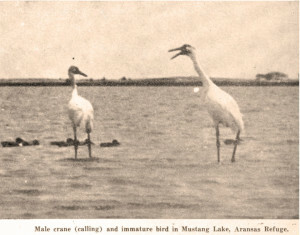 With aerial discovery in 1954 of the cranes nesting within Wood Buffalo National Park, advocates of the Whooping Crane were elated. The mystery had been solved as to where the cranes were nesting and that they were already in a protected area. Don’t miss this presentation on the protection and recovery from the nesting grounds in WBNP. Be sure to purchase tickets for our awesome raffle this year ~ benefitting the conservation of Whooping Cranes! Stop by our Visitors Center now to purchase your raffle tickets. The Chamber will also be selling raffle tickets and our 2014 festival T-Shirt at the Bird’s Nest Trade Show. Stay up to date on the festival excitement by checking us out on Facebook, Twitter and our website! Port Aransas, Texas ~ Naturally Fun! Local expert birder, Mel Cooksey, will be a guest speaker discussing shorebirds at this year’s festival. Additional presenters will discuss the Eastern Partnership, the Reintroduction of Whooping Cranes to Louisiana, and Are Birds and Humans Different?, among other interesting subjects. La Copita Ranch. This morning excursion wraps up the fantastic birding opportunities that we offer during the festival. Check it out! Larry Ditto’s photography workshops and trips are filling fast. Reserve your space today! Endangered Whooping Cranes taught to migrate south behind an ultralight plane! Click here to watch the story. Help us help the whoopers! Please Donate. We respect your privacy and your email address will not be shared.